Here is the list of best free connect the dots game for kids for Windows. These games let your kids learn the names of some common things, animals, etc. along with their sound. Playing these fun games, kids can also learn the correct sequence of counting and English alphabets. The purpose behind designing such type of games is to make learning fun for kids. Now, kids will not find their studies boring. These join the dots games are best suited for kids of smaller age groups. The best part of such type of games that make them interesting for little ones is the secret behind the dots. This secret makes kids curious towards the game. As they play more and more, their curiosity increases. This curiosity helps them learn alphabets, numerals, animal names, etc. quickly. Transport Dot To Dot is my favorite connect the dots game for kids. The best part of the game is that it comes with 60 dot to dot puzzles and all connect the dots puzzles are completely free. Kids have to connect the dots in the correct sequence in order to complete the puzzle. This game is very simple to play. No mouse clicks are required to connect the dots. Simply move the mouse cursor over the dots in the correct sequence and the computer will join the dots automatically. What’s hiding behind the dots remains a mystery till the puzzle gets completed. Download and install these games on your PC and let the little minds solve the mystery. You may also like the list of Best Free Learning Shape Games For Kids, Best Free Spot The Differences Game and Best Free Coloring Book Software. As per my opinion, Transport Dot To Dot is the best free connect the dots game for kids in this list. This free join the dots game is helpful to teach kids English alphabets and numbers, along with the names of some common vehicles. As its name implies, it comes with puzzles of different modes of transport like Jetplane, Helicopter, Fire Engine, Dump Truck, Logging Truck, Spacecraft, Fire Truck, etc. Now you can teach your kids the names of different vehicles used for transportation in a fun and entertaining way. This game is suitable for kids between 3-6 years of age. It contains 60 dot to dot puzzles, that makes it an interesting educational game for kids. The best part of the game is that it displays different puzzles each time it is launched. Dots are displayed in three different categories, namely, numeric dots, and alphabetic dots in both upper and lower case. You can select any of these to be displayed on the screen or can select Random Dots option to display the dots randomly. To make the game easy for little ones, the computer gives a hint by highlighting the next upcoming letter or alphabet. However, you can change this in the settings menu. No clicks are required to join the dots. Simply place the mouse cursor over the dots to connect them with each other. The computer pronounces the numeral and alphabet, so that kids can know the correct pronunciation of each numeral or alphabet. After connecting all the dots correctly, the computer pronounces the name of the vehicle thus revealed along with its sound. Christmas is one of the favorite festivals of little kids. Kids Christmas Connect The Dots Puzzles is all about the Christmas festival. 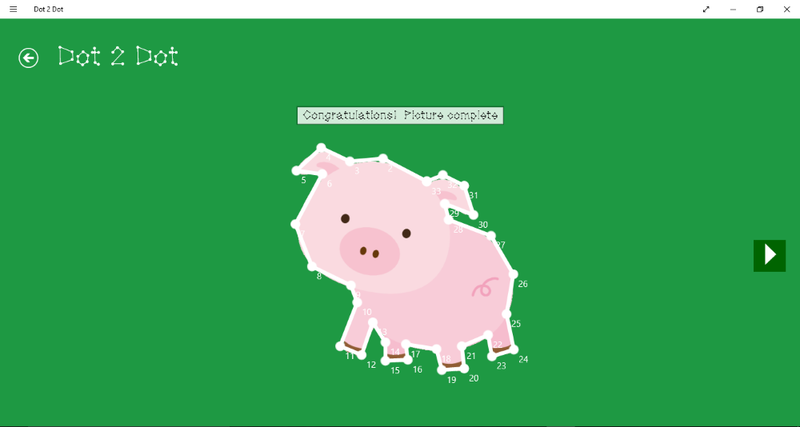 If your kids love Christmas, they will love this free dot to dot Windows 10 app. This Windows 10 app comes with two more games in addition to join the dots. These are Christmas Pairs and Mazes. In Christmas Pairs, kids have to match the correct pairs and in Maze game, they have to find out the correct way to escape. This is an educational software designed in order to develop the thinking skills in kids and make them smarter. It is best recommended for 2 to 5 year old kids. You can have the full access to the game by upgrading it to the full version by buying it. What features does the free version of this Dot to Dot Windows 10 app has? The free version of this game provides a total of 12 dot to dot games + 3 Christmas Pairs Games + 4 Mazes. 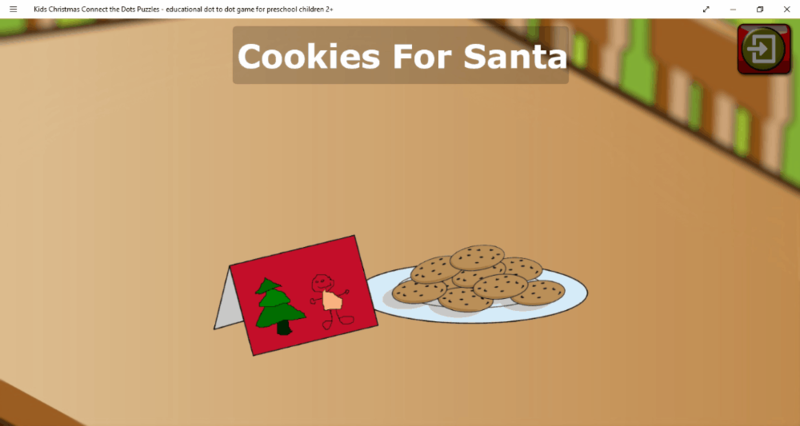 Some of the puzzles in this game include Santa Claus, Christmas Tree, Christmas Cookies, and Sledge. You can change the dots labels from numerals to alphabets in both upper and lower cases. The size of dots can also be varied from small to large. You can turn ON/OFF the hints in the settings menu. Also, the duration for hints to be displayed can be set for 5, 10, or 20 seconds. You can also reset the game anytime if kids want to play the game again. The computer pronounces each letter or alphabet while connecting the dots. After completion, the name of the object thus revealed is displayed on the screen and a sweet music is played in the background. One interesting feature that I liked is that kids will be rewarded with stars after the completion of each level. They can score up to a maximum of 3 stars depending on their performance. If they take more time to complete a level, they will get only one star and vice versa. Along with numerals, this game also helps your kids to learn the English alphabets in both upper and lower cases. Kids can learn to pronounce the names of some common things as well. OMG! The game is available in more than 20 languages. Some of these are English, Deutsch, Francais, Italiano, Portuguese, Espanol, Suomi, Indonesia, Netherlands, etc. Note: The pronunciation for each Christmas puzzle will be in English language only. Along with Join The Dots game, this Preschool ABC Zoo Animal Connect The Dot Puzzle comes with some other exciting games for kids, which include Pair Matching and Mazes. This is another Windows 10 join the dot app and is very much similar to the Kids Christmas Connect The Dots Puzzles. On one hand, kids can learn English alphabets by playing this connect the dots game, while on the other hand, Pairs and Maze games of this app help boosting their memory. The game is available in both free and paid versions. Talking about the features of the game, it comes with three different levels from Easy to Hard. As the difficulty level of the game increases, the number of dots to connect also increases. Playing procedure of the game is simple. Kids have to connect the dots displayed on the screen in the correct alphabetical or numerical sequence. No hint is provided by default to join the dots. That means, kids can connect all the dots only if they know ABC or 123 perfectly. After the completion of the puzzle, an animal image is displayed on the screen along with its name and the computer pronounces its name along with its voice. Also, kids will be rewarded with stars based on their performance in each level. 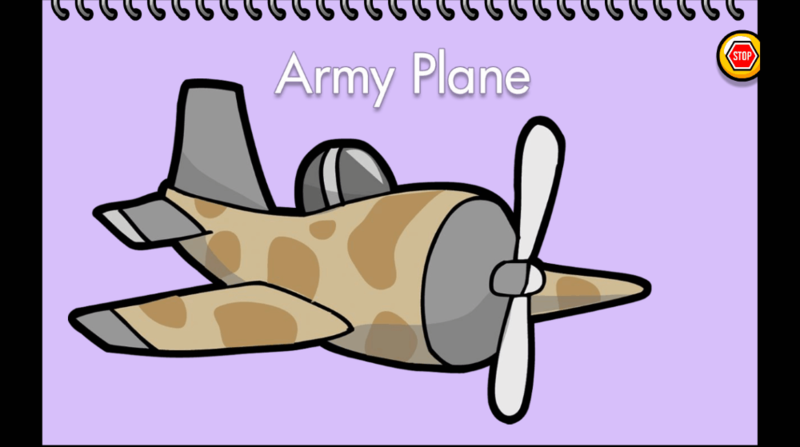 Some of the animals that are available in the game include cow, cheetah, sea lion, cat, dog, panda, tiger, crocodile, lion, monkey, hippopotamus, sheep, yak, deer, etc. The free version of this game comes with 9 Dot To Dot Puzzles, 3 Pair Games, and 6 Maze games. Can I access the Settings menu in Free Version? Yes, the free version of the game provides full access to the Settings menu. It displays English as a default language but you can change it in the settings menu. You can also change the label of dots from numerals to alphabets in both upper and lower cases. Hints can also be turned ON/OFF in the settings menu. You can also set the duration of 5, 10, or 20 seconds for hints to be displayed. If kids want to play the game again, reset option is provided for that purpose. One interesting feature of the game is that you can vary the size of the dots from small to large. This game is available in more than 20 languages. Some of these are English, Deutsch, Francais, Italiano, Chinese, Portuguese, Espanol, Suomi, Indonesia, Netherlands, Arbi, Farsi, etc. Note: Only English language is used in the game for the pronunciation of each animal’s name. Kids Insect Letter Number Logic Maze Game is a free connect the dots Windows 10 App for kids which let them learn 123 and ABC with fun. This app is specially developed for Kindergarten and toddlers. It teaches kids the names of some common insects and help them to pronounce the name of each insect correctly. 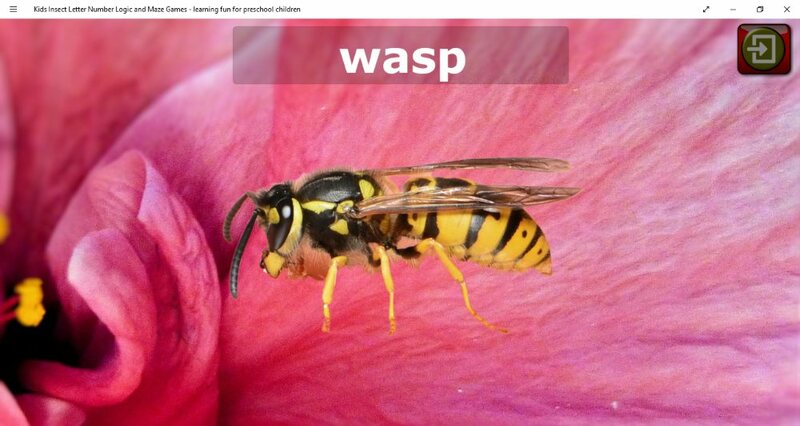 High-quality images of insects are added to the game which include ant, bee, ladybug, beetle, grasshopper, black widow spider, scorpion, earthworm, wasp, centipede, and a lot more. It comes with the images of some common insects hiding behind the dot to dot puzzle. Kids have to solve the puzzle correctly in order to reveal the insect. To make the game more interesting for kids, 4 additional games other than join the dots are added to it. These are Pairs, Slide Puzzle, Mazes, and Flash Cards. I think this is one of the best educational packages for toddlers as well as preschool kids as it will teach them counting, English alphabets, addition up to 10 and also boost their thinking ability. This app is identical to Preschool ABC Zoo Animal Connect The Dot Puzzle. A lot of games are available in the app. If you want all of them for your kids, you have to upgrade it to the full version. Also, there is a marking scheme in the game for each level. Kids will be rewarded with stars as per their performance in each level. To get maximum stars, they have to complete a level within a minimum time. Several dots are displayed on the screen, the main objective of kids is to connect the dots in the correct sequence in order to open the secret, ‘which insect is hiding behind the dot to dot puzzle‘. That’s all. Kids can join all the dots correctly only if they know 123 or ABC correctly. Let’s see how many games do you get in the free version of the app? The game comes with 12 connect the dots games + 3 Pairs Games + 6 Slide Puzzle Games + 4 Mazes + 4 Math Flashcard Games. Not bad! After the completion, the name of an insect is displayed on the screen and the computer pronounces its name. This will help your kids to learn and recognize the names of some common insects quickly. Besides this, you have a full access to the settings menu in the free version. You can change the label of dots from 123 to ABC or abc in the settings menu. You can also vary the size of the dots as per your comfort. Moreover, the duration of dot hints can be set for 5, 10, 20 seconds, or can be toggled as ON/OFF. As was the case with the 2 previous apps, this app is also multilingual and supports more than 20 languages. However, the names of the insects are pronounced in English only. 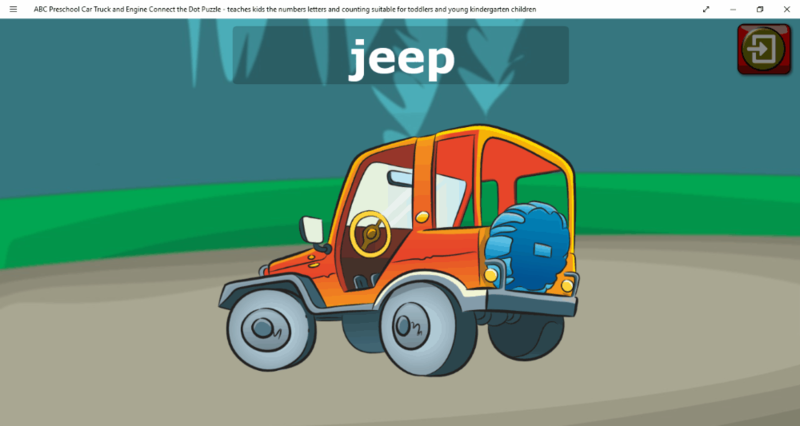 ABC Preschool Car Truck and Engine Connect The Dot Puzzle is another connect the dots Windows 10 App for kids. The app is ideal for kids of lower age groups like preschoolers and kindergarten kids. They can learn the numerals and English alphabets in both upper and lower case by playing this game. Some other games are also added to the app in order to make it interesting for kids. These are Maze and Math Flashcards. Math Flashcards teach addition to your kids in fun and entertaining way. By playing math flashcards, they can learn addition and subtraction of numbers up to 10. Dot to Dot games are categorized in three levels: Easy, Medium, and Hard. As kids switch to more difficult levels, the number of dots to connect also increases. They have to join all the dots in a correct sequence to complete a level. After completion of a level, a vehicle along with its name is displayed on the screen. It comes with the images of some common vehicles like car, truck, bus, van, train, fire engine, ambulance, police car, boat, spaceship, submarine, helicopter, bicycle, skateboard, etc. As this game is from the same developer as the previous three apps, the procedure marking scheme same as that of the above listed Windows 10 app. Only 12 out of 36 connect the dots games are available. Out of 18 Mazes, only 4 are unlocked. Kids can only learn addition in the free version of the game. Dot labels can be changed as numeric or alphabetic labels. The size of dots can be changed easily in the settings menu. Toggle Hints option is also available in the settings menu. Even the time duration for displaying hints can also be set for 5, 10, or 20 seconds. You can also reset the whole game anytime. This one is also multilingual, but with pronunciation in English only. Dot-a-Pix Light Vol 1 is another free connect the dots game for kids, which lets kids learn to count with fun. The playing procedure of the game is simple. Several dots are displayed on the screen. Kids have to match all the dots in the correct sequence. Unlike other games in this list, this game is a little bit difficult for kids of lower age groups as no hint will be shown on the screen to complete the puzzle. Kids can only view the complete solution of dot to dot puzzle. Hence, kids can only complete this dot to dot puzzle, if they know the counting. If we talk about the number of levels in the game, it comes with 3 different levels and each level has 10 different puzzles to complete. This means that the game comes with a total of 30 puzzles. I found puzzles in the third level of the game most difficult as each puzzle in the third level has more than 70 dots to connect. One interesting feature of the game is that it shows the time taken to complete a puzzle. Undo and Redo Tools: These tools can be used to go one step back and forth respectively. Restart Tool: Clicking this button, clears all the progress of a certain level and starts it from scratch. Check Puzzle Tool: Using this tool, you can check whether you have matched all the dots correctly or not? Show Solution Tool: If you get stuck anywhere in your puzzle, simply click on this tool and you will get the whole puzzle solved. Save Tool: With the help of this tool, you can save your puzzle, so that you can continue anytime. This game is good and challenging for young minds but it has one disadvantage that you cannot play it on full screen, which makes it sometimes difficult to find the correct sequence of dots. Connect The Dots is one of the best free dot to dot puzzles for kids. This is a very simple game to teach children English alphabets and counting. The principle of the game is same as all other join the dots games in this list. Kids have to connect all the dots in correct order to complete the puzzle. A total of 12 puzzles are available in the software and each puzzle has an animated cartoon character hiding behind the dots. It does not require any installation on your computer, as it is portable connect the dots game. Just download it and run its exe file on your PC. The best part of the game is that kids can learn counting and alphabets in both lower and upper cases. Kids can switch to any of these three modes anytime while playing the game. To make it interesting for kids, every puzzle in the game comes with half completed image, which provides a clue about the animated character. Now, kids can make a guess which animal is hiding behind the dots and check whether their guess is correct. To play the game again and again, reset button is provided in the software, clicking on which restores the image to the original. To ensure that kids will learn both alphabets and counting by playing this game, the next upcoming letter or alphabet is highlighted with a red color. Fun With Dots is a free connect the dots Windows 10 App. 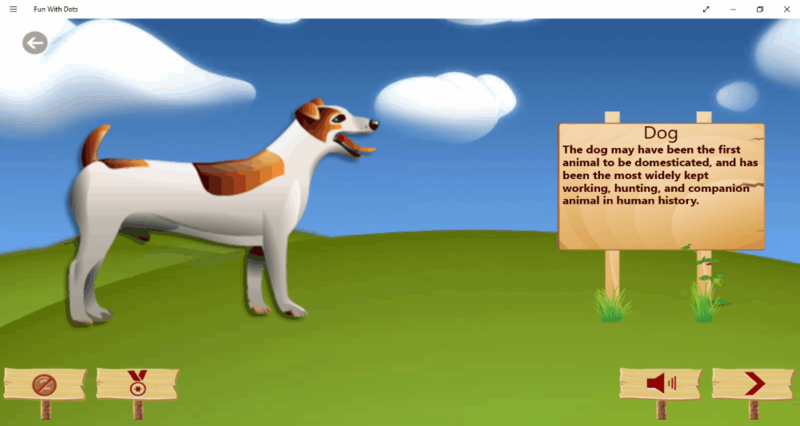 The main motive of the game is to teach animal names along with their voices to kids. Not only the animal names, but it also provides some information about animals or birds like their nature, habitat, etc. A lot of animal and bird images are available the app. This game is based on a simple method of connecting the dots. Kids have to connect the dots displayed on the screen in correct sequence to form an image of an animal or a bird. That’s all. 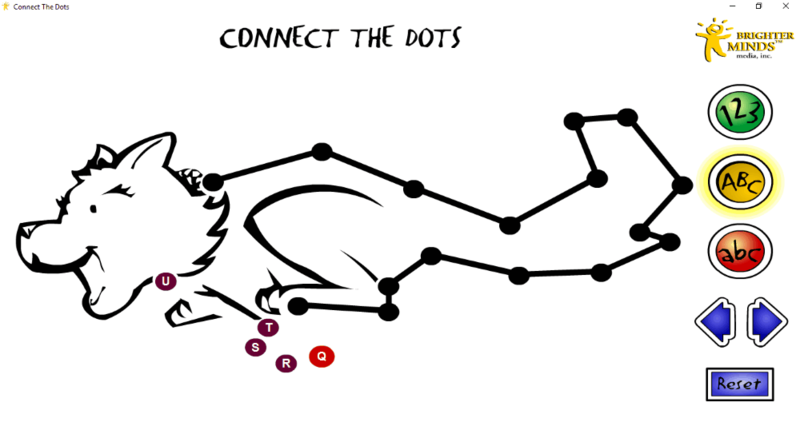 This free connect the dots game comes with three levels, namely, easy, normal, and hard. Kids can select any of these. In easy mode, dots are labeled with alphabets and numbers, so that kids can learn to connect the dots in a correct sequence. Kids can change the labeling of dots from numbers to alphabets and vice versa any time while playing the game. The computer pronounces the number or alphabet every time kids connect the dots. Normal and Hard levels of the game display the dots without any labeling. For convenience, the next dot to be connected is highlighted. After the completion, the game displays the image of an animal and kids can hear the sound of that animal. It helps kids learn names of animals and their voices. It also provides some information about an animal or a bird from different habitats. It has a lot of images to learn animal names. Some of these include Hippopotamus, Crocodile, Panther, Tiger, Toucan, Langur, Squirrel, Seal, Donkey, Kangaroo, Crow, etc. The best part of the game is that it is available free of cost. 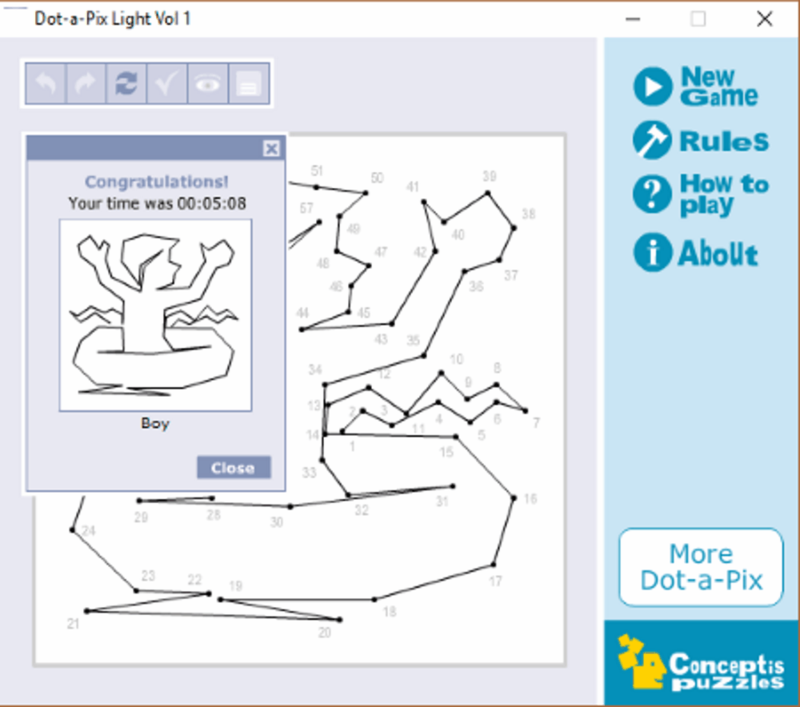 Connect The Dots Ultimate is another join the dots Windows 10 App for kids. This game is developed for toddlers and preschool kids. Connecting the dots, kids can learn English alphabets and numbers with fun. This game is available in both free and paid versions. The free version of the app comes with a good collection of 27 free games, which you can upgrade via in-app purchases. Playing this game, kids will be able to learn the names of some common animals, toys, musical instruments, fruits, vegetables, etc. Connect The Dots Ultimate is an educational game for kids of lower age groups. Initially, the picture of an animated character is hidden behind the dots. Kids have to join the dots in a correct sequence. When they are done, an image of a cute animated character is revealed in front of them. This makes the game more interesting for kids. The curiosity of kids to know what is hiding behind the dots make them play more, and the more will they play, more will they learn. After the completion of each puzzle, the computer pronounces the name of the animated character thus revealed along with its sound. This makes kids learn the names of different animals along with their sound. Why Connect The Dots Ultimate? Ideal for kids of lower age groups. 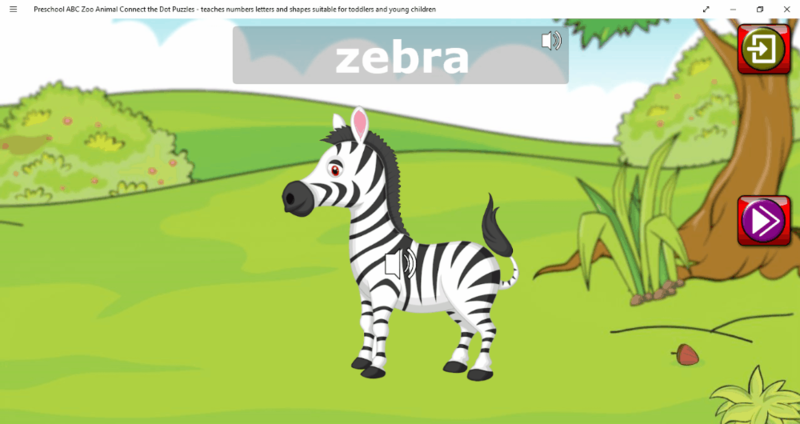 Helps kids in learning the names of some common things and animals. Comes with 27 free puzzles. Kids will be rewarded with stars that makes this game more interesting for them. 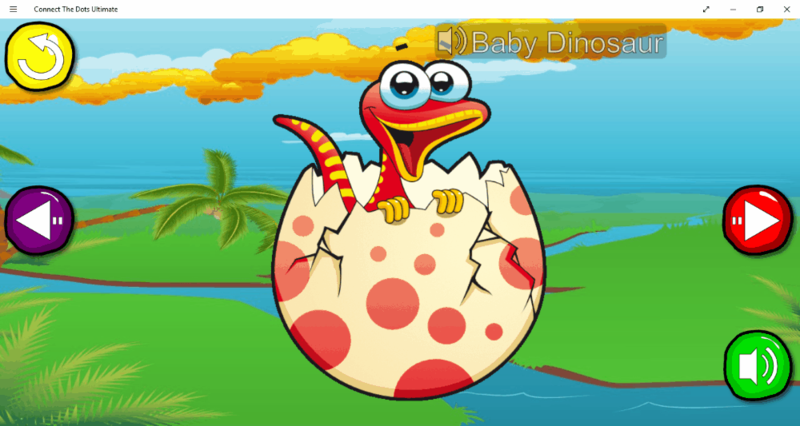 It is an award winning game for one of the best apps for families. Dot 2 Dot is another free connect the dots game for kids in this segment. The game has only a limited number of exercises, but still it is good for preschool kids. The aim of designing this game is same, i.e., to make learning fun for kids. You will find two different categories in the game, namely, Shapes and Farm. You can also select the difficulty level from Easy to Hard for your kids. One thing that makes such types of games interesting for kids is the secret that is hiding behind the dots and kids have to connect the dots in order to open the secret. All three difficulty levels of the game have same images with the only difference in the number of dots available for joining. The hard level of the game contains a maximum number of dots. Some of the shape dot to dot games available here include: Triangle, Rectangle, Square, Pentagon, etc. Objects and in Farm section include Wind Mill, Hut, Chicken, Pig, etc. In this dot to dot adventure, kids not only learn the names of certain common things but also learn to count well. The computer highlights the next dot in the series with red color, so that kids can connect the dots in a correct sequence. However, you can also select whether to highlight the dots in series or not, simply by unchecking ‘Highlight the next dot in sequence’ box. The game has some more image packs as well, but you need to upgrade to paid version for that.